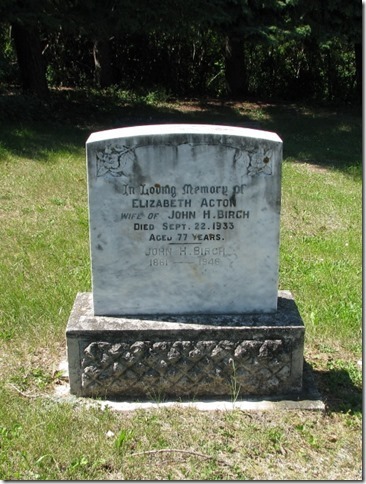 ELIZABETH (‘Lily’) ACTON was born February 24, 1956 at Bewerley, in Pateley-Bridge, in Yorkshire, England to Richard ACTON and his wife Elizabeth SHENTON. Lily’s father was the gardener at Bewerley Hall, which was a large manor house with extensive gardens (check the website http://www.lostheritage.org.uk for photos). The manicured lawns and shrubs, and large kitchen (i.e. vegetable) gardens were completely unlike the frontier Canadian experience the family was about to embark upon. About 1857 when Lily was 2 years old, her parents, siblings and some extended family immigrated to Rockingham, in northern Ontario, Canada. Here they optimistically broke land, constantly picked the rocks for which the area was aptly named and eked out a living farming. In 1864 her mother died in childbirth, leaving 8 year old Lily in the care of her older siblings. A housekeeper, Mary COULAS, was hired to help with the young family. In 1866 Lily’s father married Mary. With this new step-mother numerous step-brothers and step-sisters were born into the family. In 1871, the family – now 11 in number (Lily, her father, step-mother and nine siblings/step-siblings) lived in the small log cabin on the Rockingham farm. Photo right from the author’s collection. Taken about 1971 on the Rockingham farmstead. The original log house is clearly visible. In the 1881 census, Elizabeth (always ‘Elizabeth’ and not ‘Lily’ for official events such as census) , 25 years old, had moved to Montreal and worked as a servant for the family of Edward and Mary Stewart. Montreal was an obvious place for Elizabeth to go for work, as she had at last one sister who had married and lived there. After the 1881 census Lily disappeared from the census records until we can pick up her trail again. 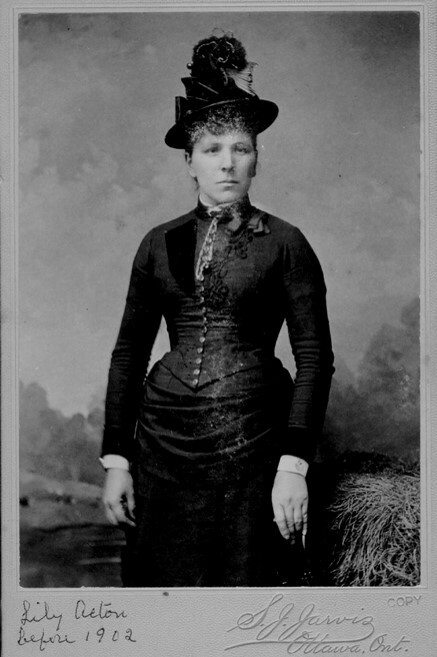 We know she traveled to Saskatchewan to visit her brother Samuel ACTON who had homesteaded and married Janet WALKER there in the 1890s. While visiting she met and married local farmer John Harold (‘Harry’) BIRCH, who was born in England December 14, 1859 (Source: John’s death registration). Elizabeth (Lily), 46, and John (Harry), 43, were married on her brother Samuel’s farm in 1902. 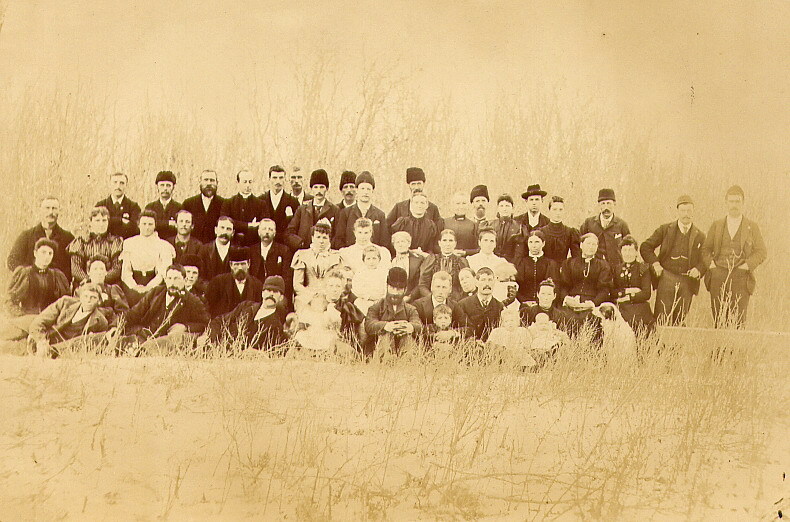 In this wedding photo they are seated to the left of centre in the second row. A curious feature of this photo is that it is obviously taken outdoors, during what appears to be winter time (lack of vegetation, fur hats being worn by the men). Why would the formal wedding photo be taken outdoors in winter? Perhaps it was the only place for the photographer to assemble such a large group. Lily and Harry farmed just south to the Qu’Appelle Valley, between Ellisboro and Wolseley. In this pre-television age, local communities created their own entertainment. One such event was an annual picnic held by the Qu’Appelle River. Third and fourth from the right are Lily (white hat) and Harry (on Lily’s left). This photo was likely taken in 1912. After some years of farming, Lily and Harry rented their farmland. In 1921 (according to both their death registrations) they moved to Victoria, British Columbia where they bought a house on Chaucer Street. 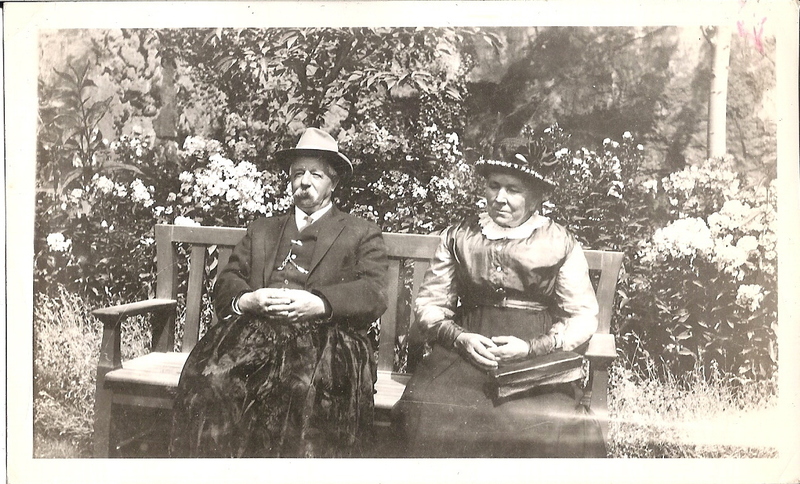 Photo left, L to R: Lily, Janet (WALKER) ACTON, Janet’s husband and Lily’s brother Samuel ACTON, and Harry. Date of photo between 1921 and 1927. Here they entertained Saskatchewan relatives. Photo below taken after Samuel ACTON’s death in 1927 and before 1933. L to R: Lily, Janet (WALKER) ACTON, unknown woman, Jenny ACTON, unknown woman and Harry. Lily and Harry died in Victoria, British Columbia, Lily on 22 September 1933 and Harry 21 April 1946. They are both buried in the Ellisboro Cemetery in the Qu’Appelle Valley, Saskatchewan. Thanks for including me in this posting. Hi there. I’m not sure if you use this blog anymore, but I sent you an email regarding some photos I have of the McKinnon’s and Acton’s. Hi Zoe, Yes – I well remember and much appreciate your efforts. And the photos you speak of should ring many bells for the Acton-McKinnon family however, although I have done considerable research on the Actons, and have circulated the photos to others doing Acton-McKinnon research ( as indeed there was a marriage between those families) we have not yet come up with any reasonable answer to naming the people in the photos. But we keep trying and hope for a revelation. Do you still have those Acton-McKinnon photos? Though DNA I have recently met a cousin who has some interesting insights in who these people may be.Thought I would give them a try again – there has to be a connection some where. Hope you are having a good summer!